Obedience is amoral. To be obedient is neither good nor bad. Rather, obedience is a means to an end. When the guards at the Nazi death camps obeyed their orders to slaughter thousands of Jewish men, women, and children their obedience led to an indescribable evil. On the other hand, obedience to God’s command to help the poor leads to righteousness (2 Cor 9:9 as quoted from Psalm 112:9). In other words, at the end of days when we stand before God, He doesn’t ask “Did you obey me“. Rather, He asks, “were you faithful to me?” This is very close to what consumed St. Paul in Romans. According to St. Paul, obedience in the service of God’s will is the proper expression of faith. What many of us forget is that the Hebrew word for faith, (אָמַן — aman) and its derivatives, was understood by the Jews of Jesus’s day to mean trust or fidelity, loyalty1)See Harris et al, Theological Wordbook of the Old Testament, Ref 0116.0.. To Jesus, loyalty and fidelity meant to abide by the tenets of Jesus’s teaching of Torah. For the apostles, faith in Jesus simply meant that they trusted Him — more specifically, they trusted that His teachings were true and correct. I remember when I taught my daughters to swim, I first had to gain their trust. When I asked them to jump into my arms from the side of the pool, they did so, although reluctantly, because they trusted me — they had faith that I would catch them. Were I not to have caught them their faith in me would have been compromised. I would have broken their faith. In Jesus’s day faith and obedience were largely inseparable. Jesus and His contemporaries viewed a person’s outward behavior as the expression of the person’s interior faith (Matt 7:16, James 2:14-26). This is not the case today. Many [esp. Western] Christian doctrines have largely disconnected faith from obedience. To we moderns, faith has become an interior, spiritual quality more related to piety and emotional commitment and less related to fidelity. This is especially true in much of contemporary Christianity where faith connotes a relation to God contingent largely on the belief that His grace will be freely offered to sinners. Thus, many Christian pastors spend an enormous amount of time talking and writing about faith in God and Jesus and little or no time about what it means to be faithful to God. This is regrettable, because being faithful is what merits God’s grace. 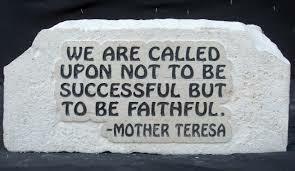 Just to be more specific: faith in God means being faithful to God. To be faithful is to live by God’s rules, not our own. Thus, St. Paul was correct. We are not, strictly speaking, saved by obedience. We are saved by our faith in God as demonstrated by being faithful to Him. According to all the great teachers in the Bible — Moses, the prophets, Jesus, St. Paul and the Apostles — being faithful to God means that you strive to obey His commands. To behave in ways counter to His will is to break faith with God (Numbers 5:6, Deut 32:51, Ezra 10:2, etc.,). At the same time, to fall short of God’s standard is not a sign of faithlessness, it’s a sign of humanness – Remember, God will not ask you on judgment day, “Did you obey me?”. He will ask, “Were you faithful to me?”. In other words, trying to live by God’s ethics and moral values is what counts because He does not judge us by our successes – how much we give to the poor or by the number of little old ladies we help across the street. It is enough to simply live by God’s values and living according to God’s values, which is to say behaving accordingly, is to be faithful to God’s will and “walk in His ways” (Micah 6:8). Finally, it turns out that there is another purposes behind the LORD’s requirement that we be faithful to His commands and that is to achieve holiness. Now, holiness has nothing whatsoever to do with piety, reverence, high liturgies, or shouting hallelujahs so that all might hear. In God’s view, to be holy means to be “set apart” or “sanctified“. Being faithful to God (i.e., being outwardly kind, compassionate, charitable, truthful, and just) was, and still is, the means by which the Christian and the Jew are distinguished from non-believers. Here, St. Peter meant to remind the faithful they were to set themselves apart from the rest of the surrounding pagan cultures. To accomplish this command, believers were to conduct their lives in ways faithful to the law, the prophets, and most importantly, to Jesus. Faithfulness was (and is) the path to holiness and salvation. 1. ↑ See Harris et al, Theological Wordbook of the Old Testament, Ref 0116.0.